Spend any time at all in the Pagan or metaphysical communities, and you're bound to meet individuals who have some fairly pronounced psychic abilities. However, many people believe that everyone has some degree of latent psychic skill. In some people, these abilities tend to manifest in a more obvious manner—and in others, it just sits under the surface, waiting to be tapped into. There are different kinds of psychic abilities. Some people are able to divine the future. Others get messages from the spirit world. A few may be able to read the thoughts of others or see "auras" that tell them how the person is feeling. Precognition is the ability to know the future. For some people, it's very definite messages, like "You're going to get on a bus and meet a dark-haired man." For others, it may be more vague, such as, "Someone close to you is going to have some big changes in their family." Intuition, or intuitiveness, is the ability to just *know* things without being told. 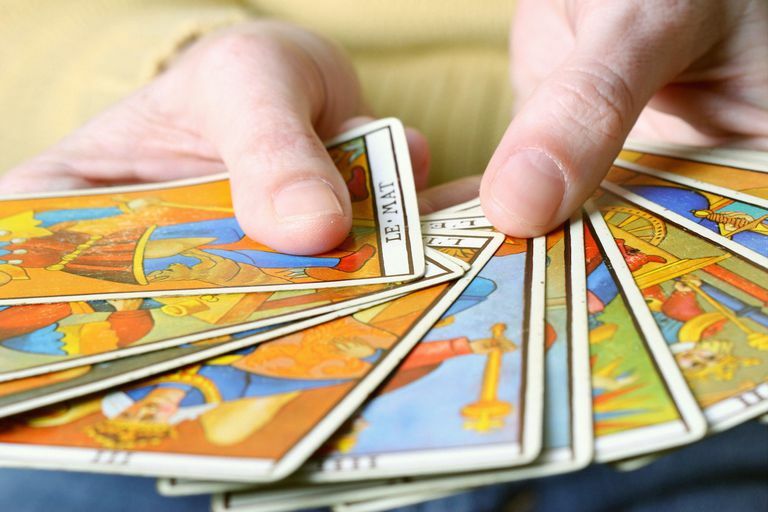 Many intuitives make excellent Tarot card readers, because this skill gives them an advantage when reading cards for a client. This is sometimes referred to as clairsentience. Clairvoyance is the ability to see things which are hidden. Sometimes used in remote viewing, clairvoyance has occasionally been credited for people finding missing children and locating lost objects. Empathy is the ability to sense the feelings and emotions of another person. Someone who is an empath often needs to learn to shield themselves from the energies of others, or they might find themselves feeling drained and exhausted. A medium is someone who gets messages from the spirit world. This can take many forms—some mediums see and hear actual spirits, others get messages via dreams or visions. Some can even "channel" the spirit, who may then write or speak through the medium. If everyone has some latent psychic talent, then developing yours can be an exercise in many different types of self-awareness. One of the best ways to develop your own psychic abilities is by way of ​meditation because it allows us to tap into our subconscious and everything that's lurking there. Achieve deliberate clarity. This sounds complex, but it's not. To achieve deliberate clarity, you need to train yourself to be aware of everything around you. Sense changes in the sunlight and shadows, notice a shift in the wind, be aware of who has walked into a room and who has walked out. Take mental notes of everything—this will help you later on, when you try to decipher what messages are "real" messages, and what's just your imagination or wishful thinking. Listen to what's being said, and what's not. Frequently, people say one thing but mean something entirely different. When you ask your friend how she's doing, and her answer is, "Fine. The kids are good…" but there's no mention of her spouse, then perhaps there's a reason for it. Understand that omission is still a form of communication. Meditate regularly. One of the best ways to develop your own intuition is to meditate. By allowing your mind to wander into the depths of the subconscious, you create an opening for messages to come through. Learn to trust your gut. Ever get a feeling that something wasn't quite right? Ever feel like you just had ​to turn left at that stop sign, even though you normally would have turned right? Pay attention to things like this. Often, there's a reason for those intuitive messages. Write everything down. Did you have a dream about someone you know, or a particular situation? Did you just get a feeling that something important is about to happen? Keep a journal so you can track these sensory messages. Later on, you can go back and check on them, to see if there was any validity to them. Bear in mind, sometimes we get messages and we are never able to confirm whether they were accurate or not, because there's just no way of knowing. Test yourself. If you have a hunch about something, try to confirm it. For example, when your best friend is on her way to meet you for coffee, try to guess what music she was listening to in the car. Then, when she arrives, ask her. Did you get it right? If your phone rings, before you pick it up and look at the Caller ID, try to visualize who might be calling. Then answer the phone and see if you were correct. Simple exercises like this will help you develop your own innate abilities. Practice makes perfect. Okay, maybe it won't make you perfect, but it sure will allow you to develop skills you didn't have before. Try learning about different forms of divination, and when you find one that resonates with you, keep at it, until you know that the messages you're getting are valid.